I decided after I created my painted image to run it through my Big Shot with a Basics Grey Ornament Sizzlet. The new Graphic45 Winter Wonderland Collection has a few of the colors I used so I figured it was the perfect fit for a Christmas card. I cut out the cream background with a Nestabilities die and used Distress in Tattered Rose on the inside of the stencil. 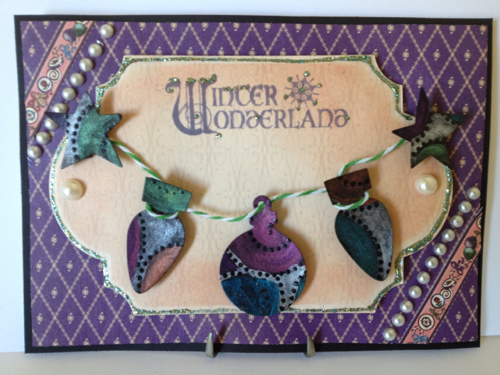 Patina Stickles was used to line it and as an accent to the "Winter Wonderland Sentiment". It's hard to tell in the photo but I used dimension pop dots under the purple paper, the label and under the ornaments. Using the diagonal lines as a guide I placed a strip of the G45 paper and laid strips of pearls adjacent. This is actually my first holiday card of the season...I love how this technique adds so much color, shimmer and interest to paper projects no matter the theme or style! The Challenge at Stdio L3 is being sponsored this week by http://www.simonsaysstamp.com/. This week at Simon Says Stamp and Show Blog they are having a challenge where you use your "favorite" whatever ....be it product, technique etc. This card is just perfect because it fits so many favorites for me, sorry but its hard to pick just one but I think my answer is fair enough, Favorite Paper Design company: Graphic 45 (they make me so happy! ), Favorite technique teacher: Tim Holtz and just for good measure, Favorite Holiday to create for: Christmas!!!! Thanks for your kind remarks. I'm not sure if you saw my note on this post but I forgot to add DT after my name during the Linky process. Will you please consider me for your Design Team? Thanks so much! Beautiful ornaments! Lovely use of the technique! Great choices of favorites! Glad you joined us at Simon Says Stamp and Show! Hi Adrienne, lovely card hun. I did see your comment on the challenge blog about the DT call. Don't worry your entry will be considered. Thanks for entering the challenge and the DT call.